From the top name in competition research and development for many top race teams comes these fully CNC ported masterpieces. The latest in wet flow technology produces a minimal cross sectional area with max velocity air flow. Full attention is applied to each intake runner, exhaust runner, chamber and bowl area, for the best flowing heads of their class. Designed for use with 8mm valves for increased air flow. Professional porting now available to everyone! From the top name in competition research and development for many top race teams comes these fully CNC ported masterpieces. The latest in wet flow technology produces a minimal cross sectional area with max velocity air flow. Full attention is applied to each intake runner, exhaust runner, chamber and bowl area, for the best flowing heads of their class. • Custom porting is also available! CNC ported masterpieces from the top name in competition research and development. 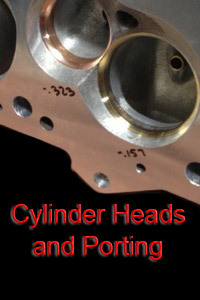 The most powerful 24° standard port height Chev BB head available. 380cc intake runners flow up to 450 cfm. The latest in wet flow technology produces a minimal cross sectional area with max velocity air flow. Full attention is applied to each intake runner, exhaust runner, chamber and bowl area, for the best flowing heads of their class. 119cc chambers can be milled to 110cc. Designed for 4.500″ minimum bore. • Most Powerful 24° Chev BB Head Available, Period! Special orders are not a problem!